Globalisation has provided importers and exporters with access to markets which span many countries and many borders, and with that comes multiple challenges. Despite simplified customs unions and trade agreements the requirement to provide accurate product classification has never been more important. Similarly, the birth of eCommerce as led to overseas purchases growing at exponential and consumers often want (need) to calculate their expected total landed costs before purchase. 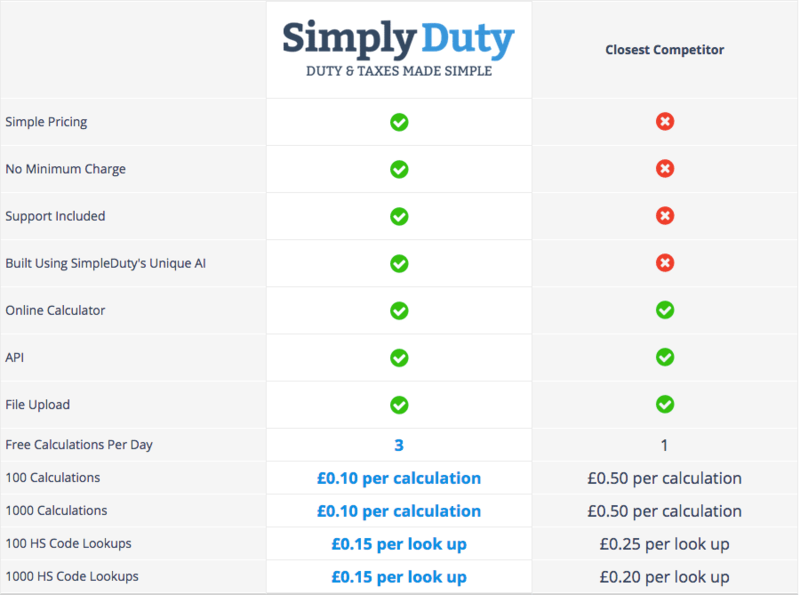 This is where SimplyDuty comes to life. HS Code classification becomes a simple task, duty rate calculations are now fast and easy to find and integrating services into your business system has never been easier. A quick glance at the table and you will see where we have an edge and in turn why you will have an edge over your competitors.